So I’ve been crazy busy with what seems like a million projects but I finally have some time to sit down and blog about something for the first time in 6 months. And this is something I’m super excited about! 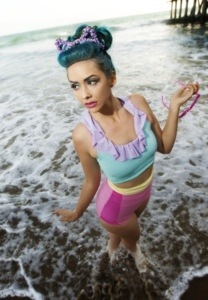 Introducing Pretty Star Clothing’s first ever swimsuits! My model for this shoot was the darling Zilla308, Stephanie Shaw. This girl is so attractive it is unfair. And good news! All of these suits are available right now in my etsy!